Are your children good test takers? Smarty is despite or maybe because she is gifted. Somehow it always rubs me the wrong way. 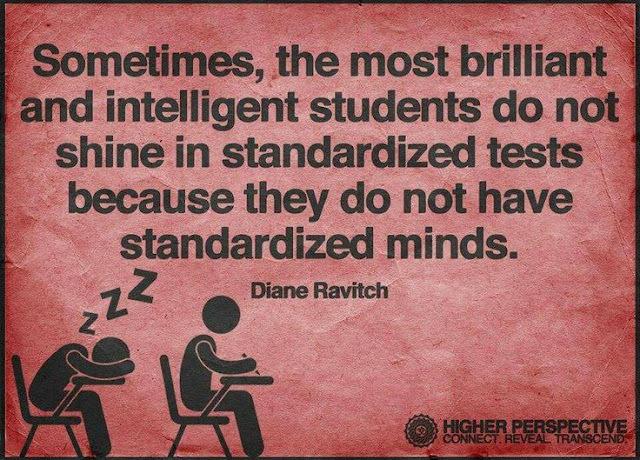 It seems to imply that only children with "standardized minds" (whatever that might be) will do well on standardized tests while brilliant and intelligent students will not shine. I beg to differ. Intelligent children who don't shine on these tests are likely to have issues that need to be addressed and not just explained away. They might have hidden learning disabilities, problems with attention, anxiety, or overthinking. Also, this attitude to standardized testing denies recognition to children who do exceptionally well on them. Recently, I stumbled on an interesting article Gifted vs. Gifted which discussed the fact that there are various ways of defining giftedness. 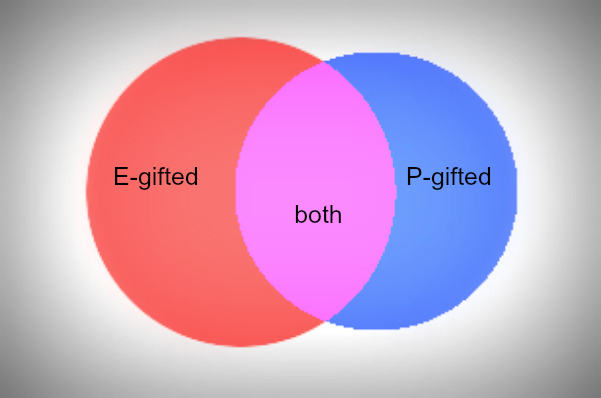 E-gifted in this article are defined as children that are top 10% of the class based on their achievement tests, and P-gifted are children who are designated as gifted by IQ tests. Smarty belongs to that purple sweet spot. She was identified as gifted through COGaT testing that she took in the second grade, and she consistently shows high achievement in school. By now, she took California standardized test for 3 years - in third, fourth, and now in sixth grade after skipping fifth grade. All three times she got a maximum possible score both in ELA and in math categories. Does it mean that she has a "standardized mind"? No, it means that she brings a ferocious focus to high-stakes testing and does what is expected of her. I am very proud of her to be able to rise to expectations, to tune out distractions and anxiety and just simply show what she can do. Does this performance on standardized tests make it easier to advocate for unique needs of my daughter in school? Honestly, I don't think so. My biggest beef with these tests is that they are grade-based and don't measure a real level of our daughter. So I will still have to push our school and to "prove" that Smarty needs to be in the 8th grade or maybe even in high school program for math. Frankly, I keep wishing that it would be the other way around, that the teacher would actually take a look at these results and thought, "Gosh, I'd better find ways to challenge this kid." Unfortunately, the prevalent attitude seems to be, "Good, one less kid to worry about" or "Excellent, perhaps she can help others". It seems that the only time when these results really matter or recognized is in the last couple of years of school - until then, it's just another data point in the student file carrying a lot less action for exceptionally good results than it would for exceptionally bad results. I completely understand that kids who don't meet standards on grade level need help, but this help should not come at the expense of kids who are sitting in the same classroom serving as peer teachers and not learning anything new for themselves except maybe how to teach others, whether they want it or not. Are your children good test takers? I have to respectfully disagree. 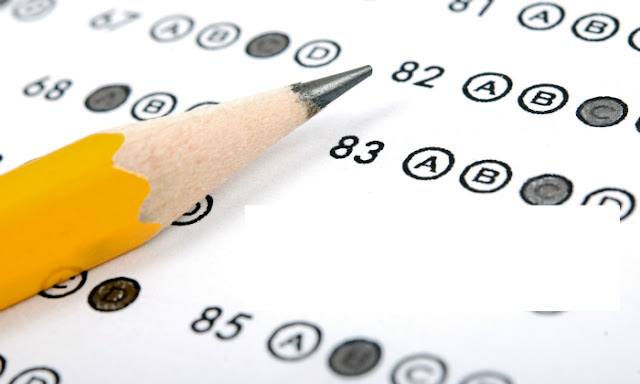 I have a divergent thinker who can justify most answers stated on standardized tests. To me, her mind does not naturally work in the way schools expect. I have trained her to find the standard answer that the test makers expect. She scores high but she can see beyond the simple standard answers. That just goes to show you that the tests are flawed, not the child. I also know people who are gifted in music or spatial visual abilities but the tests do not even test in these areas. I highly recommend the book, Most Likely to Succeed. There's a portion in it that discusses how standardized tests were created and for what purpose. Kids who are mathematical/logical and verbally gifted tend to do well on tests. It does not test for creativity, outside the box thinking, or even ability to problem-solve in real world situations. It tests your ability to do well on tests. I keep thinking about Thomas Edison, who was not traditionally smart according to the schools, but was quite gifted in other ways. I don't think the meme is necessarily wrong, it's just not complete. My daughter is a nervous test taker because she wants to be perfect.